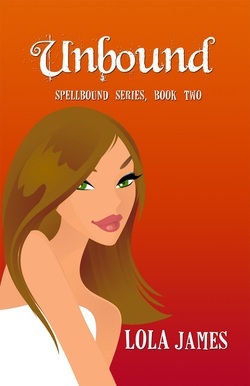 This is book two of the Spellbound series, this was a fantastic sequel to Bound to Remember. Part two opens with a love pentagon, yes you read that right. Kevin, Ben, and Hades all vying for Antonia’s affections, while Catherine appears trying to get Ben back. Lola James did an awesome job using all of her characters in some way to help Antonia; the way the lives were woven together was just amazing. I was left hanging at the end of book two, so I can’t wait for book three! 15. August 1 Going Crazy! Wanna Go? 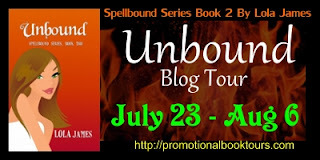 Enter to win a free Ebook Copy of Unbound! So glad you liked and thank you for having me!! These sound like great books and I would love to win. Crossing my fingers. Sounds like a pretty interesting book! Thanks for the chance to win! Sounds like a good read! Hope I win! Wow, this book sounds pretty interesting and a great read. Great review. I really must read this book. Sounds interesting! Sounds like an interesting book. I may look into it. Hmm, I may look into this, I love to read! Sounds like a great read! I will put it on my list. I've never heard of this book. I really appreciate the thorough review, Bookworm Babblings! Sounds interesting, I've never read a paranormal romance before. Sounds like such a great book. This looks like an interesting read! I know a few ladies in my book club would love it! sound like a great story!! !thanks for sharing!!! I LOVE to read and this sounds right up my alley! Thanks so much! I'll be adding the first two books to my "to-read" list on Goodreads! Thanks for sharing! I'm intrigued! A love triangle with the Lord of the Underworld? Wowzers! I'm going to have to check this out! i never heard of a love pentagon before. interesting! I don't think is my type of book but I wish Lola James the best on this book and many more. Thanks for sharing. This sounds like a great book! Thnx for sharing! Nice Review! It seems like this will be a good book! Thanks for sharing! Ooo I hope I win! I just bought a Kindle and I can't wait to start loading it up with new books! I love to read, trying to get that idea going around the house, great review! Would love to have the chance to read this one, thanks for sharing! Sounds like a series my daughter would LOVE! Thanks for sharing! Thanks for sharing...I don't get to read fiction too much any more, well at least for adults. It's all about children's lit for the past 4 years =). It looks like I may have to find more time to read :) Sounds like a great book.